With two colors and slightly ribbed, this crochet pom pom beanie is easy to match any outfit. Disclaimer: Although this yarn was given to me, I have not been compensated to review this yarn. All opinions in this post are my own. When Red Heart sent me this Baby Hugs yarn I couldn’t resist but crochet up a cute baby hat for this little guy. It’s a soft and lightweight yarn, which makes it perfect for the baby’s soft skin. The yarn also offers a lovely stretch once worked up. Another bonus is that it has been tested for harmful substances, so you know it’s safe for your babies. And because you know it’s safe, it’s the perfect yarn for making baby shower gifts. 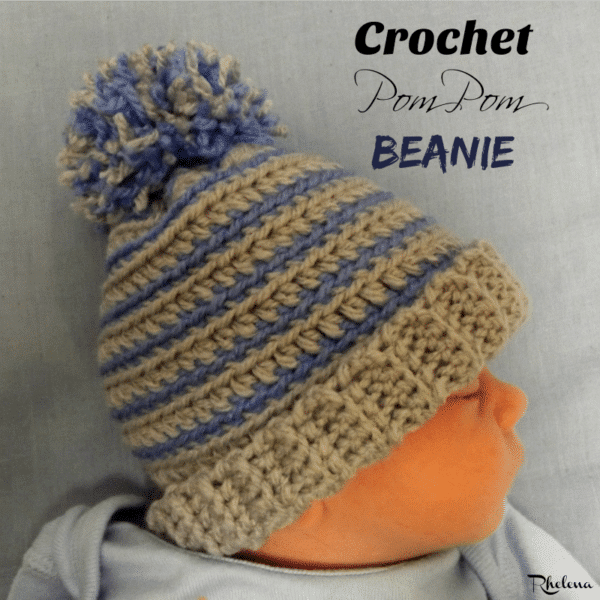 This pom pom beanie pattern is given in one baby size, but it can be crocheted to any size that you like. It’s started at the brim with the ribbing, then joined and worked in rounds. And since there is no stitch pattern, it’s easy to adjust in any multiple of 2. It is shown in a boy color-tone, but you can choose any colors and make this for both boys and girls. Another pattern suitable for both genders is this striped hat. Or, check out this roundup of baby boy hat patterns. Gauge: 3.5″ over 16 ribbing rows and 15 sts. Join each round in both loops of first stitch made in the round. Join new color to previous color after the round is joined. Or, fasten off after color change and start new color with a standing crochet stitch. Carry unused yarn up at each round. Rows 2-50: Ch 1, blsc in each st across. Turn. (8 sts) Continue with this row until you have reached a desired circumference. Ch 1 and join the ribbing rows by slip stitching the last row to the free loops of starting chs. Rnd 1: Continue with CA, ch 1, sc 50 sts evenly around; join with sl st to first sc. (50 sts) Do Not Turn, but begin working in rnds. Rnds 4-13: Rep Rnds 2 and 3. Rnd 15: With CB, ch 1, blsc in same st as join, blsc2tog around; join with sl st in first blsc2tog. [13 sts] Fasten Off. Fasten Off CB leaving a 10″ tail for weaving in through Rnd 15 and closing off the hat. Make a pompom and attach to the hat as shown. 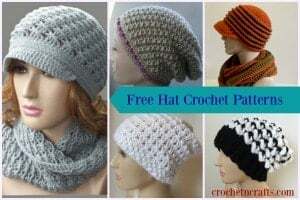 If you enjoyed this baby hat pattern, you might also enjoy a visit to CPB for even more free crochet baby hats.